he high school student is safely strapped into the seat of the amusement park roller coaster. She selects the “Roller Coaster” mode in the Physics Toolbox Sensor Suite app, secures her smart phone in her pocket, and enjoys the ride as the car climbs slowly over the waiting crowd below, pauses dramatically at the top of the track, and then plunges downward. After the laughter subsides and her heart returns to its normal rate, the student checks her phone. The app has employed its various sensors to measure, collect, display, and record data, such as g-force. Rebecca Vieyra (MSED ’10), K–12 program manager at the American Association of Physics Teachers (AAPT), and her husband, Chrystian, a software engineer and Android and iOS app developer, created the Physics Toolbox mobile app. 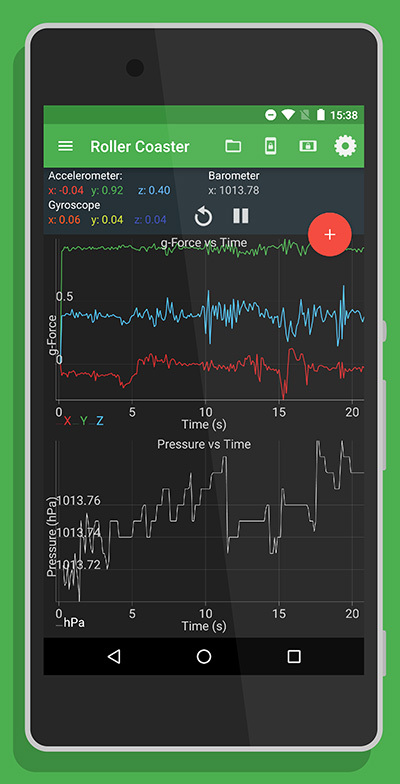 With its various sensors, including a g-force meter, linear accelerometer, gyroscope, barometer, and magnetometer, the toolbox has been used by students and professionals worldwide to measure everything from the acceleration of a playground swing to the noise levels near hospitals in Pune, India. The couple’s brainchild, now more than three years old, grew out of the need for students in Vieyra’s former high school physics class to solve a variety of assigned challenges. Although the app has more than a half-million users, it is free and generates no income for its creators. “Despite the very happy fact that nearly 60 percent of our users are from engineering and technical fields such as the music and medical industries, I want people to recognize that this is an educational effort, and that I’m an educator at heart,” says Vieyra. A National Board-Certified teacher, Vieyra is a former Presidential Awardee for Excellence in Mathematics and Science Teaching and was honored in 2014–15 as a NASA Albert Einstein Distinguished Educator Fellow. At the AAPT, which supports all aspects of physics education, she writes and manages grant proposals, and as a representative on Capitol Hill, champions the value of STEM education to policymakers. On the Vieyra Software website, students can find lesson ideas relevant to high school and college-level STEM courses as well as help in answering science questions about common activities, such as “How does the normal force on my body change during an elevator ride?” Students, along with teachers and other professionals, often share YouTube videos and photos of their physics experiments on the toolbox’s Twitter site.